The days of having to shuttle files between machines on USB sticks seems like a distant memory from a simpler time. Today, it’s all about the cloud. 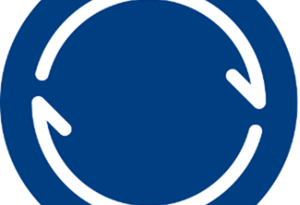 Want to access your files from more than one machine? Nothing could be simpler: Just stick them in Dropbox (and hope there isn’t another authentication bug), or Drive (courtesy of our corporate overlords at Google), or SkyDrive (developed by the benevolent behemoth that is Microsoft). To put it differently, cloud-based file sync services are easy to use and work well, but your privacy may or may not be their first priority. Not to mention the fact that these services always come with a storage quota. You can try to maximize the free storage space, but a quota is a quota. 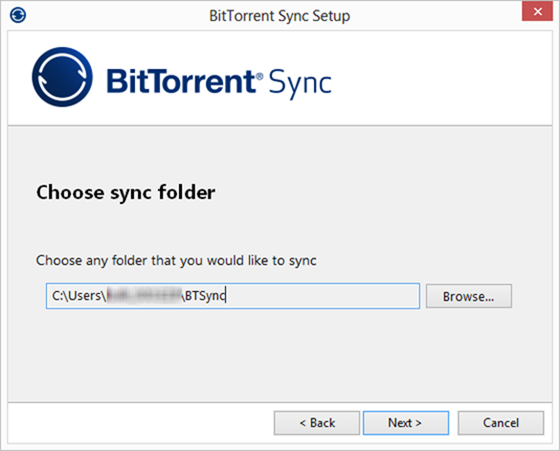 If you’re longing for an alternative, you should check out BitTorrent Sync. This new service from BitTorrent harnesses the power of the distributed file-sharing network to keep your own private files in sync. 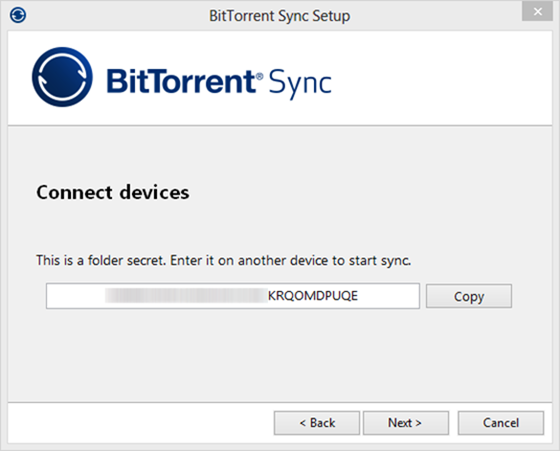 It’s not like torrenting your files, though: BitTorrent Sync works with secret keys that let you selectively choose what to share with whom, and even supports expiring, temporary keys. Let’s walk through installing the service and sharing a folder. 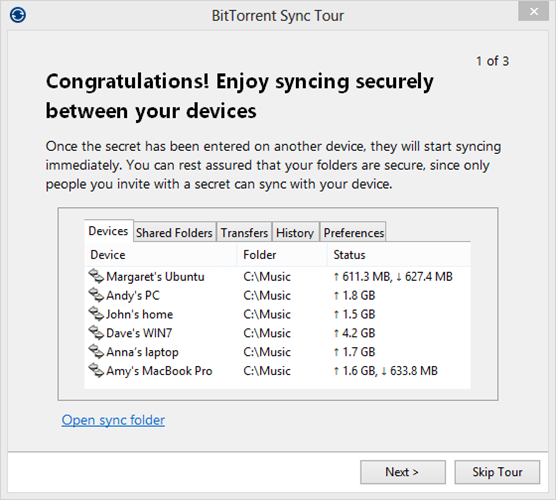 It’s worth noting that you can use BitTorrent Sync to synchronize any folder, not just its own special folder. This is a long string of characters which you can then use to connect to this folder from any other device. This is a key difference between BitTorrent Sync and other file-sync solutions: There are no user accounts, and you won’t be asked to create a password for yourself at any point in the process. Rather, each folder has one or more secrets, and that’s what you use to connect to it. Once you finish the tour, you’ll find yourself in the BitTorrent Sync interface proper. 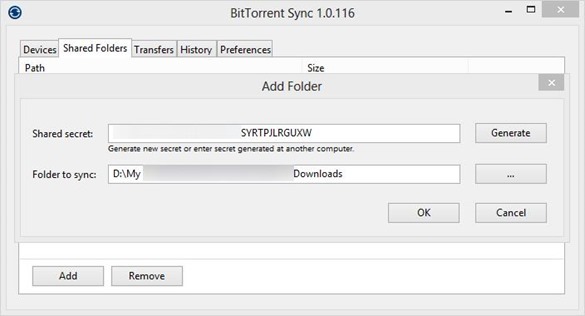 Once you add a folder that already contains files, BitTorrent Sync will take a few moments to index its contents. 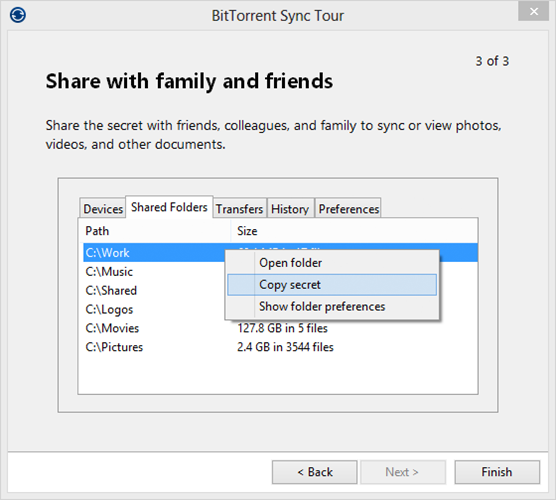 You will already be able to copy its secret and share it with other BitTorrent Sync users. Once I entered the secret for this folder on another computer running BitTorrent Sync, the other computer’s name showed up in the BitTorrent Sync window, and files started going through instantly (they were on the same LAN, but this should work over the Internet as well, assuming you’ve let the installer configure your Windows firewall). One thing really bears another mention here: When BitTorrent Sync gives you a secret, it means it. It is a secret. Anyone who possesses this magic string of letters will be able to gain access to the folder you’ve shared, no questions asked. Yes, you will see an unexpected device name in the Devices tab, but that will be too late: By then, the hostile party may already be in possession of your files. Here you can see the folder’s existing secret, its read-only secret (for allowing permanent read-only access), and generate one-time secrets. A one-time secret can only be used once, and expires after 24 hours. That’s pretty awesome. 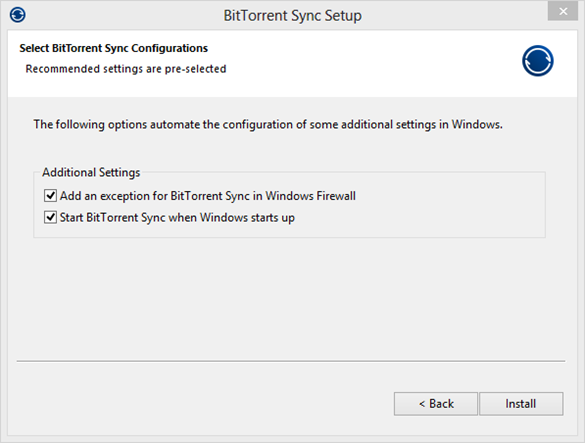 BitTorrent Sync gets a lot of the basics right. Setup is a snap; you can share any folder; you don’t have to create user accounts; and the underlying file-transfer technology is, shall we say, extensively field-tested and proven. Whether or not it catches on as a mainstream means of synchronizing files — only time will tell. But this initial test shows that there’s a lot going for it.